Of course we have our wine in our farm store, but guess what else we have in store for you?!! We are honored to partner with the Sepe / Pirro family to offer CT Grown lamb that is pastured and grain fed in a natural, stress free environment. Lambs are raised without feeding hormones, additives, or antibiotics. Sepe Farm is all about promoting sustainable agricultural “best practices” and protecting our environment. We are picky about our chocolate and so is Birrn chocolate from VT. Makers of handmade truffles, Jeff & Bill Birnn understand of relationships, even when they include cows. As third generation confectioners, they are producers of premium truffles. One of the most important ingredients to their success is using fresh, heavy cream from Vermont cows, and gently blending it into the truffle's ganache center. YUM! Bee keeper, Gilman Mujac produces the some of the best honey we have ever tasted. We offer both raw and regular honey. And if you want a taste, try our cheese plate that features Gilman's honey, and if you are lucky we will have some honey comb. The Emery Family has been making maple syrup for their family for many years. 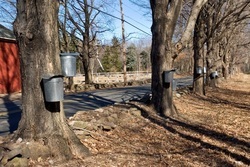 They are now sharing their bounty with the community by offering the Maple Syrup for sale at our vineyard.